The day was set to be a hot summers day with beautiful wall to wall sunshine. Gary got ready at home with all his groomsmen and Annabelle was ready at her mums with her closest of friends. I met Gary and Annabelle at the Old Mill’s wedding fair a year prior to the big day and since then we have done a wonderful engagement shoot and now were ready for the day itself! St James Catholic church is a beautiful 1830’s Catholic church set within the Abbey Ruins in the heart of Reading town. The church was ready for the 11am ceremony of Gary and Annabelle and I captured photographs of the stunning bride arriving with her bridal party in a VW Camper. Annabelle’s cousin proudly walked her down the aisle to meet Gary at the other end. 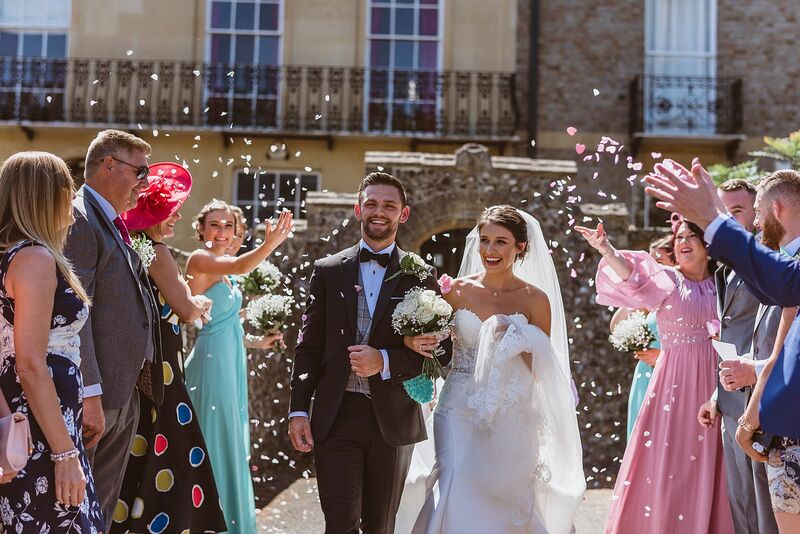 After the ceremony Gary and Annabelle joined all their guests outside to be met with lots and lots of confetti! We then captured some group shots in the entrance way of the church before making our way to the reception for drinks and canapes at The Old Mill, Aldermaston. 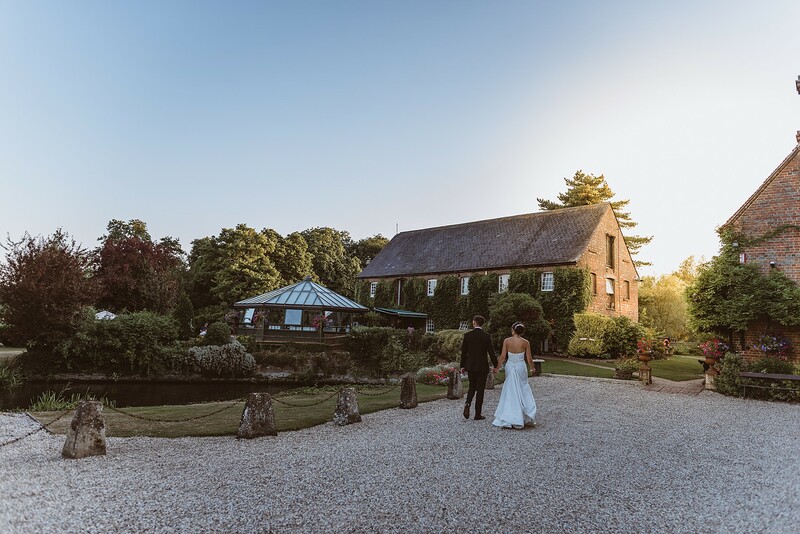 There guests were able to enjoy the sunny day in The Old Mill’s beautiful grounds, playing garden games and sipping on summer drinks plus eating delicious canapes – Sounds perfect and it really was! Just before the wedding breakfast, I whisked Gary and Annabelle off for a couples shoot in the grounds which has so many photo opportunities at every corner. Once back, it was time for everyone to enjoy the wedding breakfast and speeches which were full of love and emotion. As the evening was starting to close in, we headed back outside to the most incredible sunset light and…. wow! We captured some amazing sunset photos. The evening was about to get started with the cutting of the beautiful, simple and elegant 3-tier cake with the first dance to then follow. The dance floor was then brought to life with guests showing their moves late into the evening!